Clete A. Kushida, M.D., Ph.D. is a neurologist, a professor in the Department of Psychiatry and Behavioral Sciences at Stanford, division chief and medical director of Stanford Sleep Medicine, and director of the Stanford Center for Human Sleep Research. He is founding president of the World Sleep Society, past president of the World Sleep Federation, past president of the American Academy of Sleep Medicine, and founding president of the California Sleep Society. 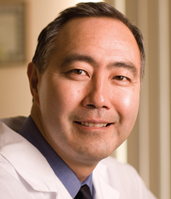 Dr. Kushida has conducted basic and clinical sleep research since 1977, served as principal investigator for numerous large federally and industry sponsored studies, and his research interests include the anatomic and physiologic changes associated with sleep apnea, the management of restless legs syndrome, and countermeasures for sleep loss. He has authored or edited over 250 publications; he has also authored or edited six books, including serving as editor-in-chief of the largest publication on the field of sleep to date, the Encyclopedia of Sleep (4 volumes, 429 chapters, 748 authors); and editor-in-chief of the journal Sleep Science and Practice.